A frightened girl is stalked in a land of eternal night. A hunter longs for recognition and power. A traveler in time returns to correct the mistakes of the past and faces a danger that could rob him of his future. Unless his future intervenes. One of Doctor Who’s strengths has been its recurring cast. For fifty years, the Doctor has taken on the Daleks, the Cybermen, the Sontarans, and the Silence just to name a few, has had run-ins with villains such as the Master and the Great Intelligence, and fought alongside Earth’s mightiest defenders in U.N.I.T. and butted heads with the secretive Torchwood. The show has built such a rich history and universe in its time on the air (and off of it, depending on your definition of canon) that the reappearance of characters can either bring a warm smile to a viewer’s face or cause them to cringe slightly at their mere mention. Early on in their time with the audio license, Big Finish were careful with introducing recurring characters. Up to this particular story I will be reviewing, only one original character makes a reappearance in multiple audios. Bev Tarrant is a archaeologist who is first introduced in The Genocide Machine and then makes her return in Dust Breeding, before heading off to become a major character in the Bernice Summerfield line of audios. In those two stories, Bev is a supporting character, serving in a way as a companion during the scenes where Ace was in another place/plot line. Introducing new characters is always a tricky prospect for any type of fiction medium, especially if the writer means for them to return in the future. On one hand, you could get someone who’s as amazing as the Brigadier. On the other hand, you could get a misfire such as the Rani. A writer has to be careful and walk a fine line; a character’s bonafides have to be established to support the story, but done in a way not to risk the character becoming a detriment to the story, either by being overpowered, annoying, a deus ex machina to be used when a writer can’t conclude their plot, or perhaps worst of all, by being simply unimportant and interchangeable to the story. Project: Lazarus marks the second appear of Nimrod, a character fix introduced in the Sixth Doctor audio Project: Twilight, as well as the return of Cassie, the reluctant vampire, and the mysterious black ops organization known as the Forge. It also marks the first multi-Doctor story since the very first Big Finish story The Sirens of Time, as Colin Baker and Sylvester McCoy cross paths in episodes three and four. Building off of the previous story, Project: Lazarus contains several interesting plot points and an amazing performance by Maggie Stables as Evelyn Smythe. But it’s Nimrod’s return that is the selling point for this story, and it’s a return that ends up being almost completely superfluous to the plot itself. Nearly four years later, the Doctor, now in a new body, finds himself visiting the Forge once again. The facility is now under siege by an alien race for unknown reasons, and the Doctor offers his assistance in establishing a dialogue with the strange creatures. 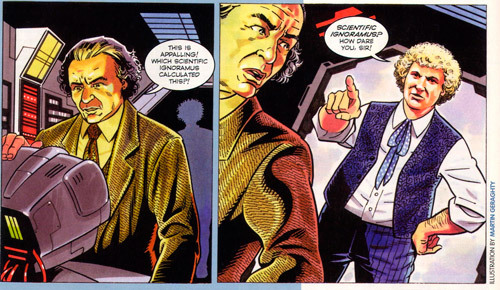 However, the Forge already has a scientific adviser – the Doctor’s previous incarnation! Nimrod makes his second appearance in a Big Finish audio, and will go on to be part of several prose pieces and the audio conclusion to the “Project” trilogy, Project: Destiny. Once a scientist known as William Abberton who turned soldiers into vampires to assist England in winning the Great War, Abberton was attacked by his own subjects during an escape attempt. Mortally wounded, Abberton turned himself into a vampire in order to survive. Taking the name Nimrod and outfitting himself with advanced weaponry and enhanced cybernetics, Abberton dedicated himself to hunting down the vampires he created. Looking at that description, Nimrod sounds like something right out of the Grimdark Age of 1990’s comic books. All he would need is a whole bunch of pouches and Nimrod could have starred in his own Image title. What made Nimrod an interesting character was his interactions with the Sixth Doctor. Stephen Chance took what could have been a character who could have solved everything by himself and rendered the Doctor a mere spectator and breathed a bit of life into him. The cadence of his voice adds to the ambiguity with which he plays Nimrod. The listener is never quite sure whether or not Nimrod is a friend or a foe to the Doctor. Sadly, this gray area goes right out the window about ten minutes into Project: Lazarus. What the script and Chance’s performance give us is scenery chewing at its finest as Nimrod becomes nothing more than a mad scientist with a shadowy organization behind him and minions who find themselves “let go” if they fail him. It’s such a radical change, going from “hunting the very creatures I’ve created” to “I will find out the secrets of alien technology for King and Country” between just one story. One gets the impression that writers Cavan Scott and Mark Wright were trying to write their “ubercool” supervillain who could show up and cause trouble, ala the Master. In the process, though, they took away everything unique about Nimrod and turned him into just another villain for the Doctor to overcome. As for the rest of the supporting cast, Rosie Cavaliero deserves mention as the vampire Cassie. Her anger at the Doctor for abandoning her for years when he could have just come back minutes after leaving her in Norway is palpable, and it does manage to at least explain (somewhat weakly) why she would throw in with Nimrod, who wanted to kill her when she first turned. Adam Woodroffe also deserves mention as the weary, battle-scarred Sergeant Firth, who takes what could simply have been another “soldier just following orders” role and redeems it with a mix of bravery and gallows humor. It should come to no surprise that, once again, Colin Baker is magnificent. He’s a part of all four episodes of Project: Lazarus, and hits damn near every emotion in the spectrum; joy at discovering a cure for Cassie’s condition, disappointment at finding out she’s working for Nimrod, outrage at Nimrod’s collection of dangerous alien technology, horror at discovering Nimrod’s fate for him, and anger, pure anger, at Nimrod at the end of the second episode. If the Doctor was ever on the verge of committing outright murder, Colin Baker was walking that very edge, his voice promising vengeance to Nimrod for what he did. It goes without saying that the day that there is a BAD Colin Baker performance in a Big Finish production is the day that it’s going to be noted in these reviews. He’s simply been crushing it ever since being the best part of The Sirens of Time way back when. 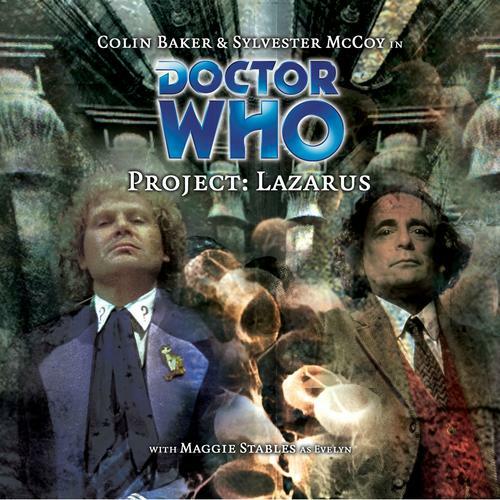 What we get in Project: Lazarus is something we have yet to see in a Big Finish audio; a Seventh Doctor sans companions. Sylvester McCoy flies solo in this audio; no Mel, no Ace/Dorothy, no Benny, no Hex (spoilers). Just him and his loneliness. He spends the first part of the third episode talking to himself, but it’s not in a “it’s an audio, so let’s transcribe what’s going on” way. It’s a lonely old man going about his day, almost going through the motions. It’s a shock to the listener who’s always been used to the Doctor having someone to play off of, someone who sighs at his butchery of grammar and dismemberment of puns. This is a Doctor at the end of his days, much like the weary Matt Smith at the end of The Time of the Doctor. It’s with a quiet surprise that the Doctor finds himself back at the Forge, and as soon as he realizes that the Forge is under siege by an alien race, the Doctor jumps back into action, demanding a chance to negotiate…but imagine the shock when he finds out that none other than the SIXTH Doctor is acting as scientific adviser to Nimrod! And that’s impossible, because the Doctor would have remembered something like that! Not only do you sense his isolation at the very end of the story, as he quietly breathes, “perhaps I should go home, back to Gallifrey,” but you see his anger at the way the besieging aliens are being treated with and his insight as he slowly figures out, much to his anger, why the Sixth Doctor is helping Nimrod after the way their previous meeting concluded. After being a bit lackluster in several of his previous audios, McCoy turns in a top-notch performance in this serial, seemingly coming to terms with the audio format. It’s Maggie Stables, though, who get the top honors in this one. As a teacher, her concern with Cassie’s fate is understandable, and she spends her time in Project: Lazarus trying to not only come to terms with what Cassie has become, but trying to help Cassie remember her humanity and what she left behind. It’s a nice way to build up on Evelyn’s concern with the fate of another student as seen in the previous Doctor Who and the Pirates. While the dialogue between Cassie and Evelyn is solid, it’s Evelyn’s actions at the end of episode two that hit home. I’ve mentioned in previous reviews that traveling with the Doctor is both thrilling and terrifying. The end of episode two is where Evelyn really realizes this, and her breakdown is heartrending. Nothing the Doctor can say, nothing he can do, can change what happened, and she can’t just blow it off and move on to the next adventure. Stables sells the hell out of her dialogue, and Baker reacts like he’s been shot in the hearts. Her heartbreak will be a facet of Evelyn for the rest of her time with the Doctor, directly leading into the next Six/Evelyn serial, Arrangements for War. It’s not pleasant to hear her character suffer so, but Stables’ performance is so good, the listener wants to hear how the next chapter is going to unfold. In a way, this serial is two different two-episode stories. The first story deals with Cassie and Nimrod’s interest in the Doctor, while the second story deal with a different Doctor trying to negotiate with a group of besieging aliens while also discovering why his previous incarnation is working with a hated foe. Both stories work for what they are; they don’t cram too much plot in, holding just enough to keep the listener interested without getting confused or overwhelmed. Why Nimrod wants to experiment on the Doctor is a bit refreshing, something different from the standard “let’s just kill the Doctor” bit that other races employ when they have the Doctor in their clutches. And why the Sixth Doctor is working with Nimrod is also refreshing, if something that an astute or veteran listener could easily pick up midway through the third episode. The banter and dialogue between Six/Baker and Seven/McCoy is off-the-charts, as the pair snipe, bicker, mutter, and attempt to one-up each other, until the time comes where both realizes just where they stand. I really hope that Baker and McCoy were in the studio together when they recorded their lines, because it would have been a real treat for anyone else lucky enough to be present. Once again, Gary Russell handles the directing duties in a strong manner, keeping the plot moving and the players playing. And I really need to pull the CD liners more often, because the sound crew (done with a Mr. Gareth Jenkins at the helm) nails the isolation of Norway and the sounds of a scientific facility under siege. The screams of the Doctor as he’s being tortured by Nimrod are bloodcurdling, a tribute to both Colin Baker and Gareth Jenkins. In the end, Project: Lazarus could have been a solid follow-up to Project: Twilight, serving as the lynchpin “middle” piece of the trilogy. But the attempt to make Nimrod a major villain fall flat thanks to the complete rewrite of his personality. In anything, he becomes nothing more than a Mad-Scientist-of-the-Week, completely interchangeable with any other villainous type a writer would plug in. Fortunately, Big Finish would introduce several other recurring characters in the near future, and hopefully they learn a lesson from the failures of Nimrod. Next – Christmas Eve in the year 3060, and the planet Puxatornee is home to a prosperous human colony. Christmas Eve in the year 3090, and the planet Puxatornee has changed beyond all recognition. The Doctor and Mel arrive, on a completely unrelated mission to defeat a race of terrible monsters, and soon discover that something rather confusing has been happening to history. Sylvester McCoy is the Doctor, in Flip-Flop. This entry was posted in Big Finish Review and tagged 3/5, Big Finish, Colin Baker, Doctor Who, Evelyn Smythe, Nimrod, Seventh Doctor, Sixth Doctor, Sylvester McCoy, TARDIS. Bookmark the permalink.